Solid-state lighting based on light-emitting diodes (LEDs) is the most efficient source of high color quality white light. Nevertheless, they show significant performance limitations such as the "efficiency droop". Blue laser diodes operated in stimulated emission offer a potential alternative. Solid-state lighting (SSL) has recently become competitive with conventional light sources and is now the most efficient source of high color quality white light ever created. At the heart of SSL is the light-emitting diode (LED). The current standard architecture for SSL is the phosphor-converted light-emitting diode (PCLED) in which high-brightness InGaN blue LEDs are combined with one or more wavelength-downconverting phosphors to produce composite white light of virtually any color temperature and color rendering quality. Despite this success, blue LEDs still have significant performance limitations, especially a nonthermal drop in efficiency with increasing input power density called "efficiency droop" which limits operation to relatively low input power densities, contrary to the desire to produce more photons per unit area of the LED chip and to thereby make SSL more affordable. 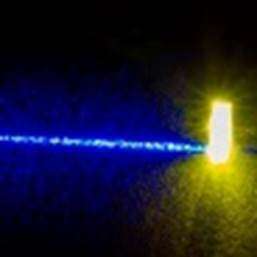 An alternative could be a blue laser diode (LD). LDs can in principle have high efficiencies at much higher input power densities than LEDs. Above the lasing threshold, parasitic nonradiative recombination processes, including those likely responsible for efficiency droop in LEDs, are clamped at their rates at lasing threshold. Indeed, at high input power densities state-of-the-art, high-power, blue, edge-emitting LDs already have reasonably high (30%) power-conversion efficiencies, with the promise someday of even higher efficiencies. A team from Sandia National Laboratories, Albuquerque (NM, USA) and Corning Incorporated, Corning (NY, USA) compared LEDs and LDs and discuss their economics for practical SSL. The scientists refer to the tremendous progress made in both device types, with current state-of-the-art power-conversion efficiencies (PCEs) of 70% for LEDs and 30% for LDs. The input power densities, at which these PCEs peak, are vastly different at about 10 W/cm2 for LEDs and 25 kW/cm2 for LDs. As the areal chip cost necessary for economical lighting scales as input power density, areal chip cost can be much higher for LDs than for LEDs. The authors conclude that it appears to be much more challenging to achieve areal chip costs low enough for LEDs than for LDs to be operated at the input power densities at which their PCEs peak. Yet, as heat-sink-limited single-chip white-light output scales inversely as input power density, heat-sink-limited single-chip white-light output can be much higher for LEDs than for LDs. A white-light output high enough for practical illumination applications should be more challenging to achieve for LDs than for LEDs. The researchers conclude, that for both, LEDs and LDs, the solution will be to shift the input power density at which their PCEs peak. Whereas LEDs need to shift to higher input power density to offset higher areal chip cost, LDs need to shift to lower input power density to enable higher white-light output. In other words, both LEDs and LDs will be made more practical and economical if they can move into and fill the "valley of droop."